Aug. 7, 2013, 12:50 p.m. The Washington Post offers Bezos the chance to reinvent a newspaper during turbulent times, and in the process leave something to his family beyond Amazon. By Tim Carmody @tcarmody Aug. 7, 2013, 12:50 p.m.
You’re right, Mr. Thatcher, I did lose a million dollars last year. I expect to lose a million dollars this year. I expect to lose a million dollars next year. You know, Mr. Thatcher, at the rate of a million dollars a year, I’ll have to close this place in… [smiles] 60 years. 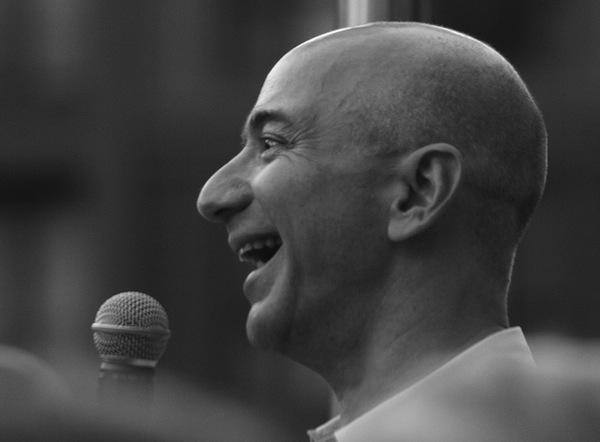 Let’s be clear: apart from his energy and broad ambition, Bezos is not Charles Foster Kane. Titans from technology companies today may have wealth and influence nearly comparable to that of railroad, oil, and silver barons of old, but if Bezos wanted to run a second company on the side for “fun,” he already has one that builds rocketships that fly into space. And in the film, Kane did burn through his wealth and sell his newspaper empire (at the precise time Eugene Meyer purchased the struggling Washington Post). Citizen Kane is Jeff Bezos’ cautionary tale. Bezos is not Facebook’s Chris Hughes looking for a second act, or Boston’s John Henry closing the circle on a local empire. And while it’s fun to write what-if fan fiction about diabolical schemes Bezos might concoct to turn the Post into an organ for Amazon’s interests or use his combined power to become a new tyrant-king, I don’t think that’s what he’s up to either. As a technology journalist who’s been preoccupied with Amazon for my adult life, I’ve spent more time than is probably healthy trying to figure out the mind of Jeffrey Preston Bezos. It’s not easy. He’s gregarious but guarded, known mostly through his letters to Amazon shareholders and rare disclosures from friends. In his own words, he’s “willing to be misunderstood for a long time.” While he can be brilliant and ruthless in business, with an uncanny ability to roll new revenues into new investments, there’s a strong and growing part of him that’s equally preoccupied with what happens when the whirlwind stops, and what he will leave behind. Bezos is looking for a legacy beyond Amazon that will survive and sustain him. There’s his company Blue Origin, which blends this extended horizon with Bezos’ long-held interest in human spaceflight. And there’s the new Bezos Center for Innovation at Seattle’s Museum of History and Industry, endowed by Bezos and his wife, novelist MacKenzie Bezos. The center is devoted to inspiring young people with stories about Seattle’s history of invention, from Boeing and Microsoft to Amazon. All of these efforts stress invention, experimentation, and patience. They also offer serious and immediate technical challenges to be solved, which seems to be what piques Bezos’ interest and how he most enjoys spending his time. In that respect, they’re very similar to his role as CEO of Amazon. But they also represent a pact between the present and the future, something you don’t immediately associate with online retail. Really, this is another way in which Amazon is misunderstood. The company has become much more than a retailer. It’s an infrastructure and technology conglomerate, tasked with building and reinventing systems, from physical warehouses to virtual currencies, that can outlast the destruction of entire industries, starting with the printed books that made the company a household name. But the Bezos Center, Blue Origin, the Ten Thousand Year Clock, and The Washington Post manifest that legacy in a different way. Part of their appeal is that to some extent, they’re walled off from the continual tumult of Amazon. “I am happily living in ‘the other Washington’ where I have a day job that I love,” Bezos writes in a note to Post employees. “I imagine he’ll be pretty hands off,” adds Amazon board member Tom Alberg. In fact, Amazon’s shareholders are counting on it. They don’t value the company at $136 billion because of its profits; those don’t exist. Amazon is valuable because of its dominant position in e-retail and because of the belief that Bezos has a vision to guide its continued growth. There are many reasons Bezos bought the Post on his own and not as part of Amazon, but one is that entangling the two company’s fates too closely could damage Amazon’s capitalization (the overwhelming source of Bezos’ wealth) tremendously. By all accounts, Bezos did not go looking to buy a newspaper. When he was approached by his friend Donald Graham about buying the Post, he initially begged off considering it. Months later, Bezos changed his mind, clinching the deal over two face-to-face meetings at Allen & Co.’s annual media conference at Sun Valley, Idaho in July. What changed? Remember, Bezos’ mind is always focused on both the dangers and possibilities lurking in the future. Looking at Donald Graham and his family, he has to be able to imagine a world — perhaps beyond his own lifetime — where Amazon’s shareholders no longer give him or his successors the benefit of the doubt and become like those at the Washington Post Co. He has to imagine that like the Grahams, Bezos’ own vision and legacy could be dismantled or compromised beyond his or his family’s control. Looking at Donald Graham, Bezos must have imagined by purchasing the newspaper, that he could at least ameliorate that fate for the Grahams. He must also have imagined that he could gather the best minds at his disposal, from hotshot web designers and technical officers to accountants and efficiency troubleshooters, to try to find a way not just to save The Post, but to build and reinvent a premier national news organization that could survive even the destruction of its own industry. Jeff Bezos has four children, who are now becoming teenagers. One is adopted, as he was by his stepfather, Miguel Bezos — a Cuban immigrant who came to the US as a teenager, became an engineer, and sent his son Jeff to Princeton. Interviews with Bezos’ friends say that his and MacKenzie’s family is unusually close-knit, stable, and traditional: Honda minivans and kitchen-table science experiments. They’re the opposite of Kane and his wife, sitting across a long table from one another in silence, reading rival newspapers. “In selling to Mr. Bezos,” writes the New York Times’ David Carr, “the Grahams left the Sulzbergers, the owners of The New York Times, as the last family standing in a club that once also included the Chandlers (Los Angeles Times), the Copleys (San Diego Tribune), the Cowles (Minneapolis Star Tribune), and the Bancrofts (Wall Street Journal).” But while it’s true that public and corporate ownership of news organizations has thinned the ranks of newspaper dynasties (and not always for the better), it’s not strictly speaking true that the Sulzbergers now stand alone. Besides the Blethen family, which has owned and operated Bezos’ local paper The Seattle Times since 1896, the club can now boast some new members. It’s become fashionable among the West Coast billionaire set to ask their children to pull themselves up by their bootstraps (if bootstraps were lined with millions of dollars), but there’s no reason to think Bezos shares this view. Instead of a public company led by the Graham family, or the enormous and equally public Amazon, the Post will become part of a much smaller company, owned in full by the Bezos family. The Bezoses become part of the same chain as the Grahams, connecting the past with the future. Jeff Bezos has something he can leave to his children, and to the world, beyond the company he runs. And one of Bezos’ sons or daughters, if he or she wishes, may become the next Walter Annenberg or Katherine Graham. This is far from the only reason Bezos is willing to take on ownership of one of our most storied newspapers now, but it’s a big one. After all, in Citizen Kane, the identity of Rosebud isn’t the master key to understanding the man, but a single piece in a jigsaw puzzle. Image by Doc Searls used under a Creative Commons license. POSTED Aug. 7, 2013, 12:50 p.m.
Carmody, Tim. "Citizen Bezos: Amazon’s founder is looking for a legacy." Nieman Journalism Lab. Nieman Foundation for Journalism at Harvard, 7 Aug. 2013. Web. 19 Apr. 2019. Carmody, Tim. "Citizen Bezos: Amazon’s founder is looking for a legacy." Nieman Journalism Lab. Last modified August 7, 2013. Accessed April 19, 2019. https://www.niemanlab.org/2013/08/citizen-bezos-washington-post-amazon-founder-legacy/.